Go from bottled up, stuck, to developing potential, creative development, self discovery. Inner riches released. Inner magic. The Creativity Emporium. to release inner riches, inner magic. one more step to a fuller life. I know the pain of being bottled up. I looked hard for a way out. I found lots of ways that helped. I also know the joy of creative development, of good thinking, of living a passionate life. Today I want you to register for FREE updates - one step to go from bottled up to releasing the magic within, releasing your potential. Register now. Receive an update. If its's not for you, you can opt out immediately, no question asked. You know there's no magic pill that will solve everything. But you're not willing to settle for living far below your potential. You want more, need more - not things, something else. You often feel stuck, frustrated, sometimes even depressed. It's not just the economy. Something is missing. You know that a rich life, a full life is possible for you. One with more inner magic, inner riches, inner fire, deep satisfaction. You want a way to get there. The Creativity Emporium - so many sides, from an exploration of home, to idea pieces, to Dr Zee's LoveLine, to spoken word, poetry, music and a preteen novel, as well as a creativity blog. No magic pill. But it offers much more than a pill that makes pain go away temporarily. It offers nourishment, stimulation. Idea pieces on everything from relationships to good thinking. Spoken word. Poetry. Music. The Creativity Emporium brings emotions more alive - the feeling of falling in love, of steady love, of knowing things are over, of waiting when waiting is completed. It also stimulates good thinking - it goes against accepted truisms that don't make sense, it really looks at what's believed and why. It's open to exploring everything from animal rights to the ultimate reality - not to give pat answers, but to engage in shared thinking, back and forth exploration. All this makes the updates even more important. Each one says: listen, feel, think, slow down, live, taste, feel, experience this moment, this thought. Don't just rush and run and stress and rush some more. You can't feel things fully when you're trying to do 17 things at once. You also can't really think things through. The Creativity Emporium and the updates. No instant answers. No one-size-fits-all formula. Instead, each update asks you to slow down and give your full potential a chance, to give your inner magic a chance. All this brings you to a fuller life, a richer life, to more passion. From bottled up to inner riches released. Inner magic released, creative development. No time? The lack of time is one of the most deadening things in the world. But what if the updates aren't enough to get you where yu would like to be? I don't expect them to be, on their own, to be enough. They're one part of the solution in the journey from feeling bottled up and living at your full potential. Sometimes there's a bottle neck where things are stuck. Maybe this is the case for you. In that case staying with The Creativity Emporium, giving space to the nourishment it offers, may be enough for you. But if I think of my own life, it took way more than one thing, not matter how nourishing and satisfying. Plus, as my needs changed, I kept searching for more nourishment. Most likely you too will want more, other things. 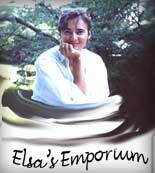 The Creativity Emporium and the updates - they don't, they couldn't, offer everything. No single nourishment offers everything - except mother's milk, for a time. But most of us are past that. Most important. One helping of any good food - even mother's milk - won't do much. The biggest benefits come from ongoing good nourishment - and that again brings me to the updates, good nourishment coming time and again. Can I offer any guarantee? All I can guarantee is that, if it doesn't suit you, you can opt out at any time, no questions asked. That's 100% guaranteed. immediate access to the MEMBERS ONLY pages. Read the update.. See where it leads you. Why enter your email address now? The web is huge. There are millions of sites. It's like with people. There are billions. But if we meet one that suits us, where we feel: there's something for me with this person, there's no time like the present. If you wait, the opportunity is often lost forever. So enter your email address now. One more step toward the possibility of a fuller richer life. I won't let anyone else have it. to developing potential, creative development, self discovery. Inner riches released. Inner magic.